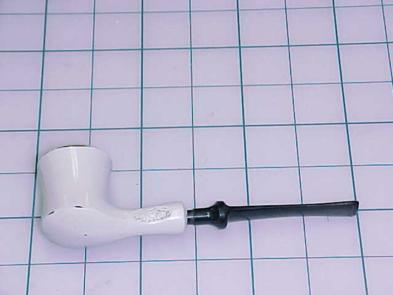 The value of pipe #263 is n/a points. Mike Elliott noticed my request for these pipes in the NASPC (North American Society of Pipe Collectors) Newsletter and offered me this new color. The literature for THE SMOKE mentions only four colors, and this is not one of them. Whether this is an additional color in the line or is a repainted pipe is unclear. If more of this color turn up in the other shapes, it will mean that the literature cannot be relied upon and that my collection of THE SMOKE is not as complete as I had thought. And another one turned up; the same Berkeley shape and in much better condition! It still remains to be seen if this color was used on any other shapes of THE SMOKE, but it is now certain that it is, in fact, an original paint job. At any rate, this one becomes a Pipe for Sale and has been moved to that page for sale or trade. It was bought by Brent Richards the day it was posted.